Newer DSLR cameras (at least those from Canon) allow to optimize the focusing for several lenses. This feature is called Micro Adjust. To fine tune the focusing you need a target to focus on. There are various versions available on the internet. All of them have to be printed on a piece of paper (size is mostly DIN A4). Then it is placed on a flat surface. The camera is then mounted on a tripod and aims at an angle of 45° to the paper. You have to make sure that the auto focus of the camera really hits the desired point and that's the main problem here. For macro shots the focus point should be in the middle of the depth of field area. For normal shots the depth of filed area is 1/3 before and 2/3 behind the focus point. That is normal. Commercial (and expensive) equipment offers a fixed target to focus on. Directly next to the target there is a 45° angled scale. There you can easily find out the depth of field area. The following solution is as easy as it is brilliant. I found it by accident in the dpreview forum. It looks like the original idea came from an japanese architect. As I was not able to find out his name I cannot mention him here. I hope he is OK with my variation of his idea. I took this idea and modified it a bit to my liking. You just have to download the template, print it, and cut it out. You can print it on normal copying paper, but that is not very robust. I use 200g/m² copy paper. I would not recommend to use (glossy) photo paper as reflections might occur and disturb the focussing. At least the reflection might make it hard to read the area in focus. Hint: If you use the back of a knife and follow the fold line with a bit of pressure, later folding will be much easier and more precise. 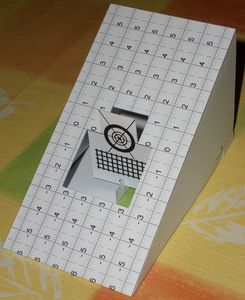 After you built the focustest target place it on a flat surface e.g. a table. Then mount the camera with the lens to adjust on a tripod. The middle of the lens should be at the same height as the desired focusing point on the target. The hardest thing is usually to have the target area parallel to the sensor. Using the parallel scales on this target it should be fairly easy when rotating it while looking through the viewfinder. The scale lines should have the same distance to the left and right side of the focusing area. Then you can start measuring and taking test photos. Canon recommends to adjust zoom lenses at their largest focal length. Personally I think you should at least do some tests also on other focal lengths. In case the found values are different you have to find a compromise so the complete focal lengths of the zoom lens give nearly the same results. As you here work with the depth of field (the area in focus) it is of course very important to have it small enough. Therefore you should do the focus test always with the largest aperture (smallest F value) the lens is capable of. Depending on the lens it might be necessary to get very close to the focus target. Make sure that you don't go below the minimum distance of the lens. It is best to have only a few centimeters of area in focus. A possible distance can be calculated using an online depth of field calculator, e.g. http://www.dofmaster.com/dofjs.html. A depth of field of around 4 cm is a good starting point. Depending on camera/lens/manufacturer the auto focus works different. Therefore it might be a good idea to set the lens to infinity or minimum before focusing. Take the picture(s) using a remote control or a timer to not get a blurry thus unusable photo. Additionally also the light has some influence on the focus. Best do the test using daylight. To get the best setting for micro adjust you can also use the autofokus "dot" within the viewfinder of your camera. First you have to mount your camera on a tripod. Search then for a high contrast subject or image (e.g. checkerboard pattern). Activate LiveView and critically focus on your subject (10x magnification, center focus point). LiveView is not needed anymore and can be deactivated. Then switch your lens to manual focus (without refocusing your lens of course) and set micro adjust to 0. Next change the micro adjust setting to positive values until the autofocus confirmation dot in your viewfinder flickers or is off. Always half press the shutter for verifiying the autofocus. Note the found value. Then repeat in other direction decreasing values. At the end you should have found a maximum, e.g. +5, and a minimum value e.g. -1. Then calculate the midpoint of the found range. In the given example it would be +2. This is your perfect micro adjust setting for your currently mounted lens. Especially for prime lenses it is important to have a subject in some distance. It has been found, that for primes you can get a micro adjust setting which works only for near distances, but not for the far. If you adjust on a far subject the found setting works also in the near. For Canon far means at least 50x focal length of the particular lens. In rare circumstances it might make sense to do the above procedure for various distances and find an average. If maximum or minimum gets to the limit of your micro adjust settings, e.g. +20, but the other one is not, e.g. +1, then change the focus a bit putting your object out of focus. So you can determine a range, e.g. -15 to +15. Add then the midpoint of your found range to the formerly found minimum or maximum vlaue. In the example the correct micro adjust setting would then be +16. For your information: The scale on the target is mounted at an angle of 30°. It is calculated accordingly to the angle which means that the scale shows the real depth of field in cm. The above image shows my first version. I hope this focustets target helps some of you. You can find some comments in the DSLR forum . Ich habe das Target auf einen Vorschlag im DSLR-Forum hin modifiziert. Jetzt sind zusätzlich eine 1/2 mm Skala enthalten. Diese kann bei der Überprüfung von Makroobjektiven und auch bei einem Ausdruck des Targets auf A3 helfen (natürlich stimmt die Skala beim Ausdruck auf A3 nicht mehr mit Millimeter überein). Auch die Fläche unter dem Zielpunkt habe ich verändert, so dass auch eine Beurteilung der Objektivauflösung möglich wird. Die Ziffern unter den Felder geben dem Abstand der Linien in der Schraffur an. Weiterhin wurde der Zielpunkt bzw. das einzuschneidende Feld etwas verkleinert. I modified the target following a suggestion in the DSLR forum. Now the Scale has alos line for 1/2 mm. Those can be used when checking macro lenses or when printing the target on DIN A3 (of course then the printed values are not correct anymore). I also changed the area below the target point. You now can get an idea of the resolution of the lens. The number below the areas give the distance of the printed lines. Additionally the foucs point and the cut out area was made a bit smaller. I found an alternative method for getting values for micro adjust in the internet. I added it above. You can also use the given target for this method or simply a sheet of paper with a checkerboard pattern. Big advantage of this method: No need to take pictures! Es geht darum den Fokus so zu verstellen, dass man einen dann symmetrischen Fokusbereich bekommt. Im Beispiel -15 bis +15. Das bedeutet der Schärfebereich ist 30 groß. Vorher haben wir aber herausgefunden, dass der Schärfebereich bei +1 beginnt. Das Ende liegt jenseits von +20. Also ist liegt der eigentliche Schärfebereich zwischen +1 und +31. Die Mitte davon ist 16 (gerundet). Generell ist bei dieser Methodeder Fokusbereich schwer zu erkennen. Wann wird es unscharf? Und da ist es völlig egal, welche Skala zusätzlich drauf ist, da das Schärfeempfinden einfach subjektiv ist und bleiben wird. Selbst eine 1/1000mm Skala hilft hier nicht weiter. Das ist ganz klar eine Schwäche dieser Methode. Keiner von uns hat ein "Meßgerät", das entscheidet wann es unscharf wird. >>Jetzt sind zusätzlich eine 1/2 mm Skala enthalten. 1/100mm sollte es schon sein, wie soll man denn sonst einen Fehlfokus zuverlässig erkennen können...? Insgesamt halte ich diese Lösung für viel zu fehleranfällig. Das Fokusziel ist zwar schön gross, wer aber kann von sich behaupten dieses in 2 Ebenen parallel 100% exakt zum Sensor ausrichten zu können? Der AF könnte den linken Rand anvisieren..oder den oberen...und schon zeigt sich ein Fehlfokus der gar keiner ist. Die beste Lösung ist und bleibt ein möglichst kleines Ziel auf einer Fläche so dass der AF diese Ziel zwangsläufig anvisieren _muss_ ... weil er rundum keine Alternative findet. Das vielgescholtene Traumfliegerchart in konzeptionell definitiv besser weil Benutzerfehler-toleranter. Wichtig: Ausdruck immer mit 100% machen und Skaliereung beim Druck abschalten. Vielen Dank für die tolle Anleitung und natürlich das Target an sich! Was ich mich noch frage ist, warum auf meinen Ausdrucken der 1cm immer so 11-12mm ist. Ich habe schon diverse Einstellungen am Drucker ausprobiert (100%, Originalgrösse, anpassen etc.) Ich bringe es nie fertig, dass 1cm auch wirklich exakt 1cm ist. Hallo, gibt es auch das Fokustest-Target auch ganz in schwarz, also die Millimetereinteilung nicht in grau sondern schwarz ? Mein Laserdrucker versucht das Grau durch Rastern darzustellen und dadurch werden die Linien nicht besonders scharf bzw haben nur schlechten Kontrast. Dünne schwarze Linien sind dagegen sehr kontrastreich.